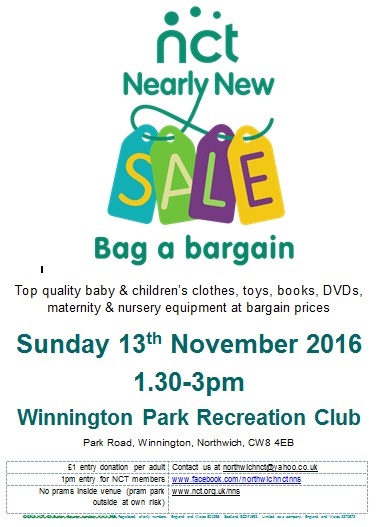 The Northwich NCT Nearly New Sale enables you to buy quality, used children's (0-11 years) and babies' clothes, toys, books, CDs, DVDs, cots, prams, pushchairs and nursery equipment. We have 100 sellers selling thousands of items at bargain prices! We would be very grateful for any help on the sale day, please email us at nct.northwich.volunteer@gmail.com if you have a few hours spare. Early entry for NCT members at 1.00pm. Please note due to fire regulations buyers push-chairs are not allowed into the sale. If you would like to sell at this sale pre-registration is essential.